Much of the advice we’ve been given about achievement is logical, earnest… and according to popular psychology blogger Eric Barker, downright wrong. 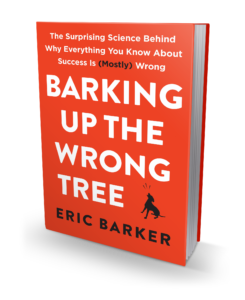 In BARKING UP THE WRONG TREE, Eric reveals the extraordinary science behind what actually determines success and most importantly, how anyone can achieve it. Like his hugely popular blog of the same name, the book draws on startling statistics and surprising anecdotes to help readers understand what works and what doesn’t so they can stop guessing at success and start living the life they want.